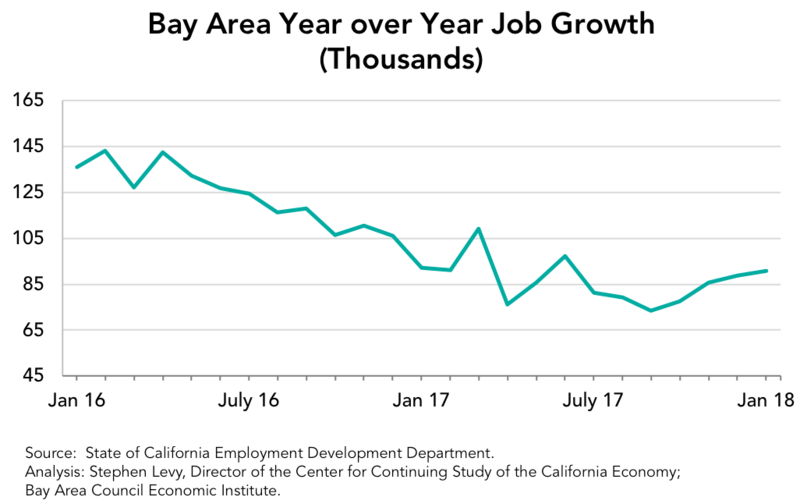 Bay Area job growth in 2017 was much stronger than initially reported and the mid-summer slump turned out to be very mild and quickly reversed. 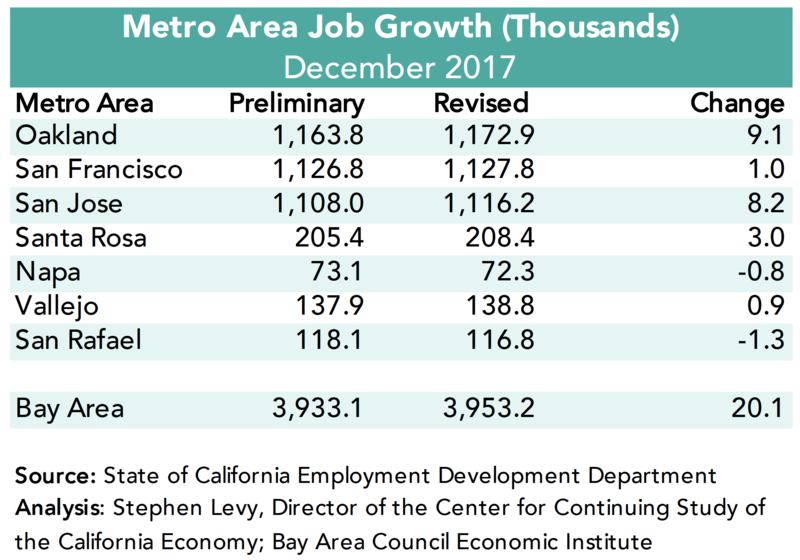 The revised December 2017 estimate was 20,100 higher than the pre-revision estimate based on large upward revisions for the Oakland and San Jose metro areas. 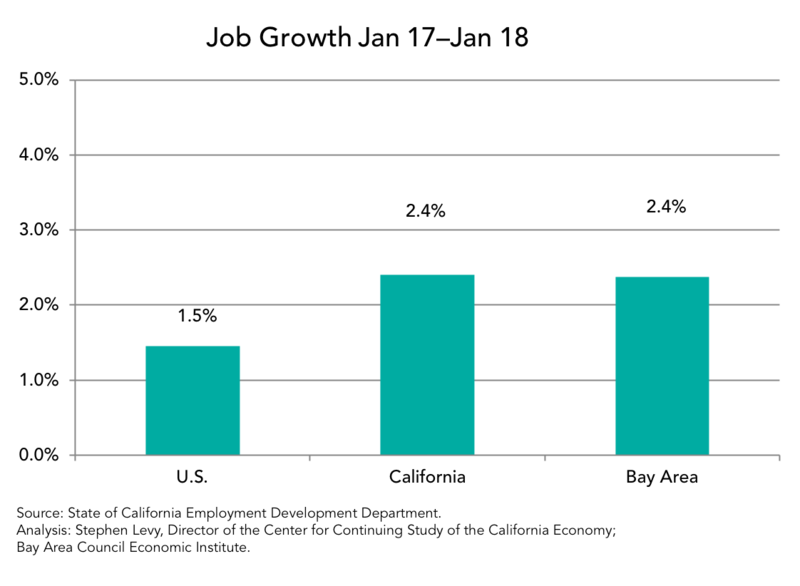 January 2018 was a solid month for the regional economy with continuing good news on the housing front. Job growth totaled 90,900 between January 2017 and 2018 toward the upper range of recent year over year job growth. 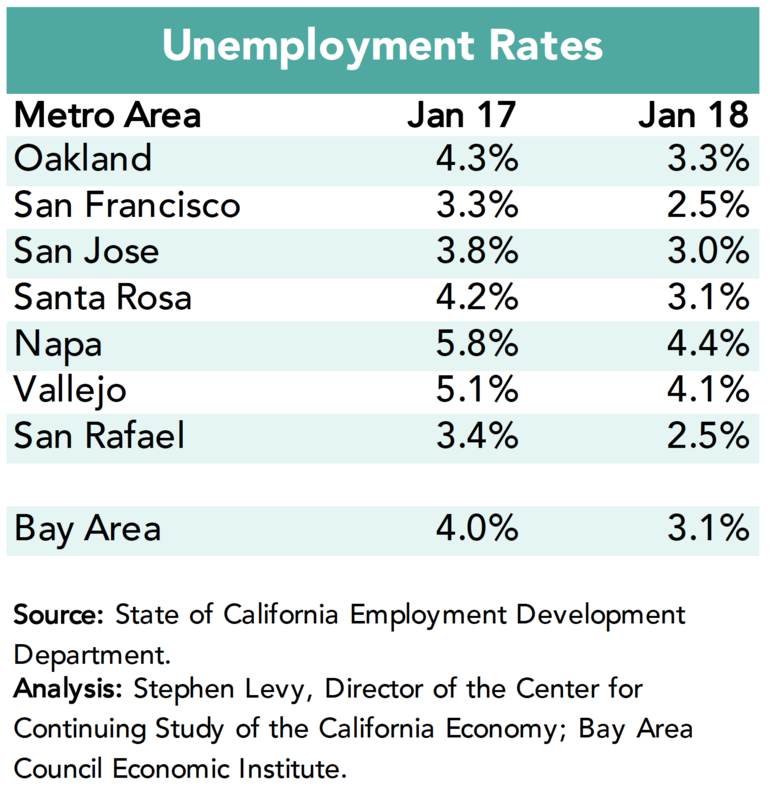 The Bay Area posted a 2.4% job growth rate during the past 12 months equal to the state average and far above the 1.5% U.S. gain. 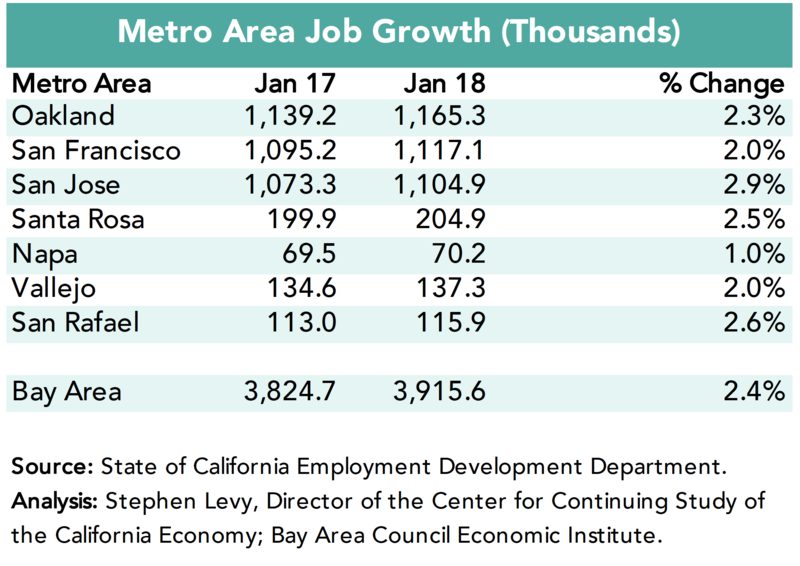 Job growth in January 2018 was led by the San Jose metro area with all metro areas but Napa showing growth of 2% or more. January unemployment rates are typically up from December rates but the year over year comparisons show a strong decline in rates. The number of unemployed residents fell by 38,500 between January 2017 and 2018. 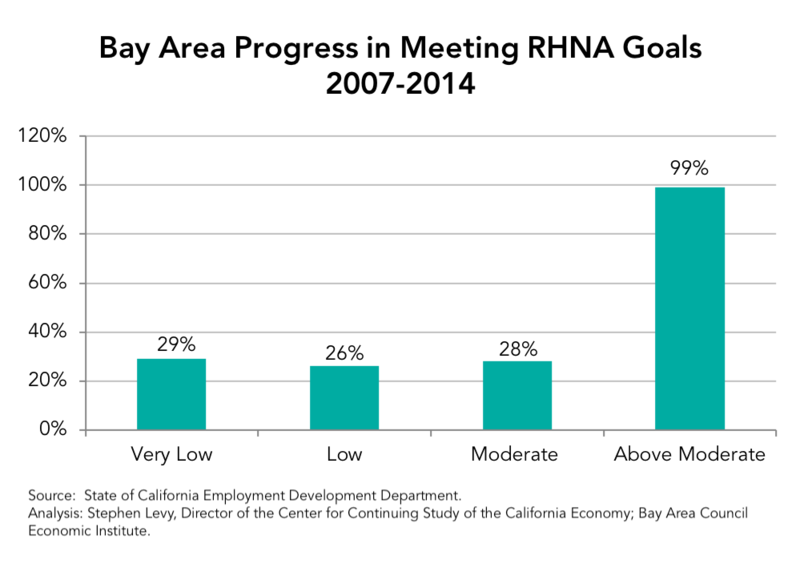 Housing permit levels surged in 2017 led by strong gains in Santa Clara and Alameda counties. There is more positive news with regard to expanding our housing supply. Plans for substantial housing in downtown San Jose are moving ahead along with plans for housing near Facebook and approvals are surging around the region. 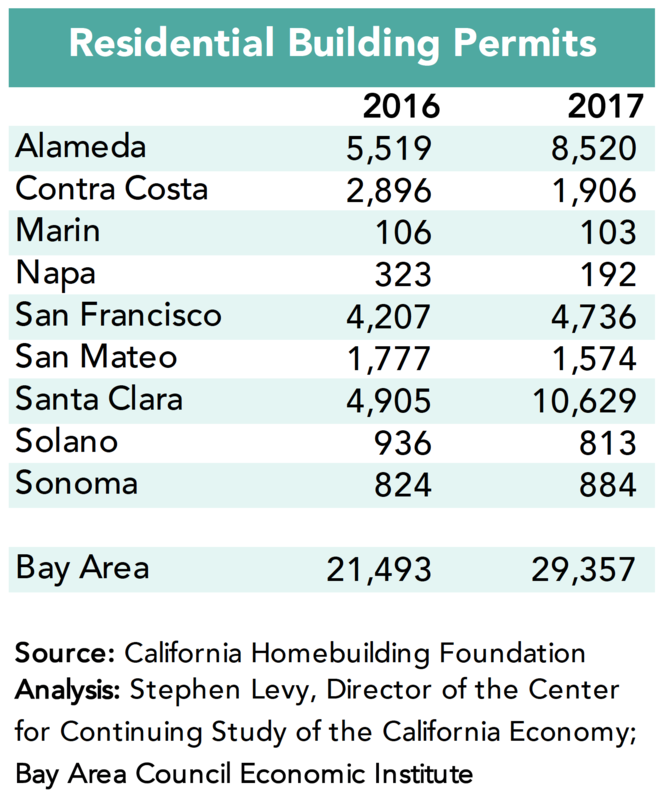 Still even the near 30,000 permits issued this year fall short of the 35,000 to 40,000 needed to keep pace with population growth while relieving some of the doubling up that has occurred over the past decade in response to low construction and rising rents. And not all permits eventually get built. Residents have passed and will get a chance in June 2018 to approve more major transportation funding measures.